Relative to the kind of weather we have witnessed in recent weeks, November was actually on the quiet side with only a few noteworthy events. For what was the first snow for some, a system on the 7th brought interior snow across northeastern PA and the Hudson Valley and left an inch across the elevations. Following this was a reinforcing front that brought an abnormal period of cold weather into the second week of the month. This certainly got everyone’s attention as it sent temperatures down dramatically into the 20s and teens across the Northeast. Records were even broken in Virginia where it was at or below freezing! A second shot of cold air on the 20th caused flurries to fly across much of northern NJ, New England, and even as far south and east as Long Island, leading to at least the first flakes for many. In retrospect, the snow in November would not compare to the kind of pattern change December brought. This is in light of November ending up with below normal monthly precipitation and temperature. December would eventually bring the real chill and snow. Well, the real cold did not quite hit us initially as we stepped off with rather mild weather entering meteorological winter. Many high temperatures were in the 40s and 50s across the Northeast thanks to high pressure. Those hoping to hold on to that were in for a surprise as the pattern would eventually usurped by a frontal system on the 5th. This began the eventual descent into winter. A cold front sprawled all the way into the Deep South, where wintry precipitation also fell. Thist led to a system off the eastern seaboard, causing the first widespread snowfall on the 9th into the early 10th. Interestingly, this left a widespread 3 – 6” of snow across nearly all of the region, from Virginia through Maine! No break in the action was to be seen after this as several back-to-back clipper systems followed between 14th and 16th, of which left a couple of inches (including a few wintry mixes), though much of it was concentrated north of the Mason-Dixon Line. During the clippers, temperatures fell about 5 to 10 degrees below normal, which resulted in high temperatures only getting into the 20s and 30s. Once we caught a break from that after 17th, temperatures did rebound above normal for a time as highs again peaked into the 40s and even 50s. However, another system produced a significant event on the 22nd across much of New England. Initially, it was cold enough to allow for snow, sleet, and some freezing rain across the area with up to 1-3” accumulations in interior Massachusetts and New Hampshire. Cold air lingering at the surface overnight into the 23rd led to a significant icing event, with up to 0.40” of ice across much of central MA and southern NH. Come the holidays, a rather large system affected northern NJ and into most of New England, which helped bring a White Christmas! This was another 3 – 6” kind of event, mainly for New England, before several reinforcing fronts ushered in a truly Arctic air mass, which began a rough stretch of cold weather. Temperatures between the holidays fell dramatically below average, at some points hitting departures of 15 to 20 below normal. 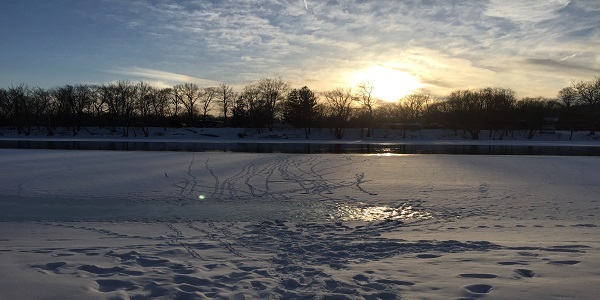 Due to overnight temperatures falling into the single digits and below zero degrees, several low temperatures records were broken. 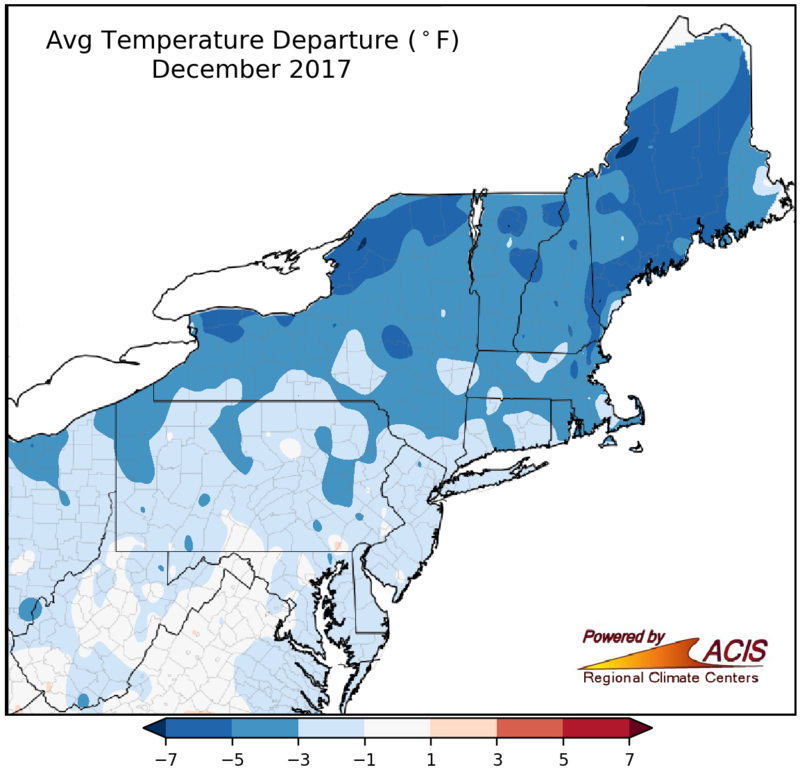 Outside of the Mid-Atlantic, everyone from Philadelphia to Boston had not risen above freezing for the majority of the time between Christmas and New Year’s Day. Despite the lack of a real blockbuster storm, much of the Northeast’s snowfall was not too far from normal. Boston, MA through Hartford ended near or just under 10 inches by the New Year, with Pennsylvania and New Jersey actually ending a few inches above normal. The pattern would continue though into January, leading to even more snow and bone-chilling weather.